This picture says it all…….Daddy, I believe in you. Your right behind me, helping me all the way. I feel safe and confident that together we can do this. Your guidance and strength will help me “hit the goal”. Why don’t I have that attitude when it comes to my Holy Father? I doubt his plan, I try and control my own situations along with the outcome. I question his plan in my life and those I love. I sometimes feel like I am walking this road alone, that he is not behind me. 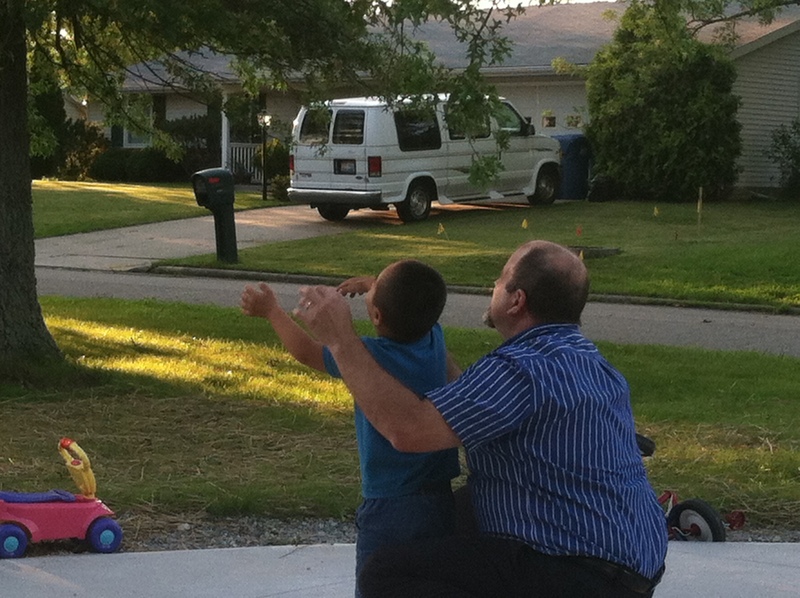 In this picture of my son Grayson and his daddy, Grayson is confident in his ability to hit the shot, his goal, because the arms of his daddy are close by. We all need to remember that no matter what goal we are trying to reach or what situation we are in right now that we have that same CONFIDENCE…..our DADDY is right behind us with his arms around us, giving us confidence in his promise to walk with us. We just need to believe and let go of the doubt. This is a great picture of confidence! What a positive and thought provoking blog. Just this week I talked to someone who went on a huge job interview. He told me that he prepared by praying for days. When he went he had that confidence you wrote about. The interview went well because he knew God was there.